Whether it’s Delhi or Dubai, Perth or Pretoria, butter chicken is pretty much a given on the menu of any curry/ Indian restaurant. It is the go-to dish for gently introducing curry novices to the delights of Indian cuisine because a good butter chicken is always heady with spice, but never hot. There is no single secret recipe for this universally popular dish. Spices depend on the chef, but what all of them have in common are these three things: butter (naturally), tomato and cream. Cape Herb & Spice’s unique butter chicken blend is a wonderfully complex mix of cumin, cinnamon, fennel, cloves and cardamom among others, with just a hint of chilli heat. Sauté onions in butter, add the spice blend, chicken pieces, some chopped tomato and cream and you have yourself a decent little butter chicken curry in no time at all. 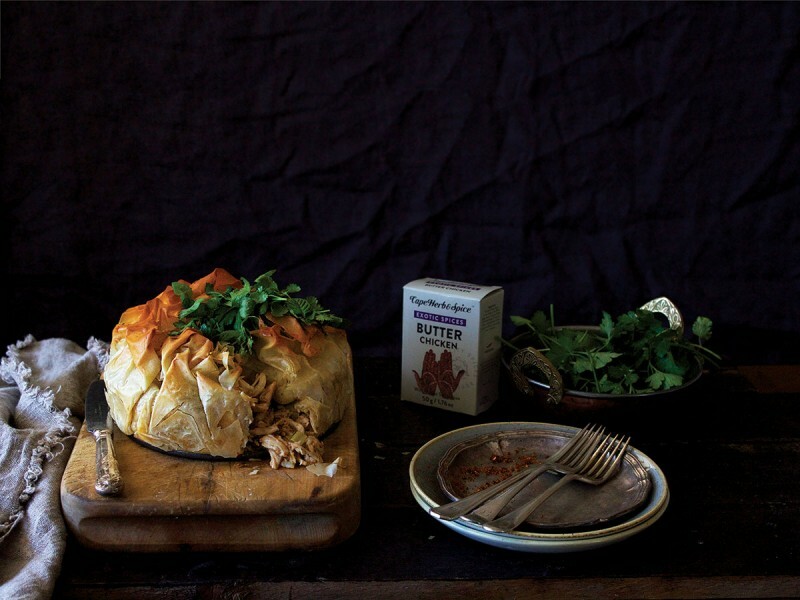 But why not make things really interesting – with this roast butter chicken phyllo pie. Using a deli rotisserie chicken means you’re halfway done before you’ve even started! It’s creamy and comforting, and will easily feed six generously with seconds to spare. Fry the onion in butter over low heat until translucent but not browned. Add the Cape Herb & Spice Butter Chicken Exotic Spice blend and tomato paste and fry for a further minute. Add the flour and fry for a minute. Add the water and cream and cook with the lid off while stirring until it starts to thicken. Add the flaked chicken and cook (still with the lid off) until the filling is very thick and creamy – 5-10 minutes. (You don’t want it runny as it will make your pastry soggy.) Taste for salt and adjust if necessary. Lay out a phyllo sheet and lightly paint it with melted butter. Top with another sheet and repeat the procedure with the remainder of the phyllo sheets. Paint a 15cm non-stick loose-bottomed cake tin lightly with butter and gently line it with the phyllo. Spoon in the chicken, fold over the phyllo edges to close it and bake in a pre-heated oven at 160˚C until crisp and golden. I like serving this pie with a simple yet punchy herb salad of peppery watercress, parsley, mint and coriander lightly kissed with a drizzle of oil, a squeeze of lemon and a grinding of black pepper.